After his interview/talk at the JCC on Saturday night, ~Thomas Keller~ (successfully) dined at Frances according to this sighting from the Dapper Diner (other tweets mention he dined with the Chronicle’s Michael Bauer, who interviewed Keller that evening). Thomas Keller at Saison. Photo from Facebook. According to a tweet, it seems Sir ~Thomas Keller~ tried to walk in for dinner at Frances as a party of three; and much to the chagrin of the restaurant, had to be declined a table. Yup, busy busy. TK and his party ended up dining at Bar Tartine instead, thanks to a glowing reco (and phone call) from Paul Einbund at Frances. 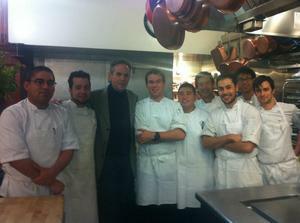 According to a tweet, ~Thomas Keller~ was in the house at RN74. And chef Alexander Ong at Betelnut was honored to cook for the 95th birthday of ~Chuck Williams~. Ong made Williams’s favorite, the beggar’s chicken, along with pig, cumin lamb, and Chuck polished off two scoops of vanilla and strawberry ice cream for dessert. tablehopper reader Patti M. spotted ~Thomas Keller~ having lunch at ~LA MAR CEBICHERIA PERUANA~.